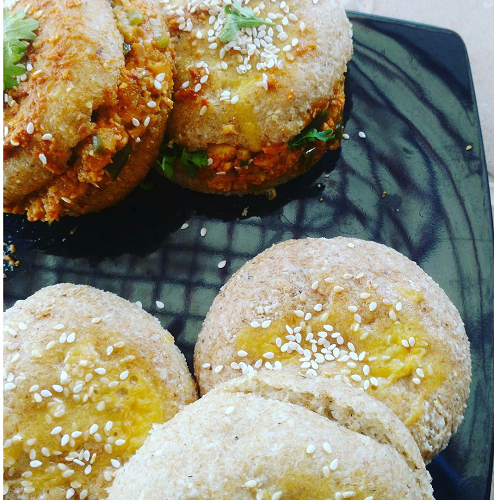 Keto Burgers/ Tava burgers is one of my heavenly creations. Before starting even to talk about the recipe, I want to assure you that this will be a guilt-free treat. So, don’t hesitate thinking this will be saved for your Sundays or a slightly high calorie-surplus day ! Tava-essentially means -A metal cast iron. Why is this related to the burgers ? When you go to any Indian restaurant, and it has a ‘Tava something’ on the menu, that means it essentially uses an iron skillet. The tava recipes comprise of thick gravies prepared in onions, garlic and other rich Indian spices and given a toasted-grilled-charred feel to the dish ! In the recipe, We just use this for toasting our burgers on the tava at the last step and also make the stuffing of the burger on tava ! 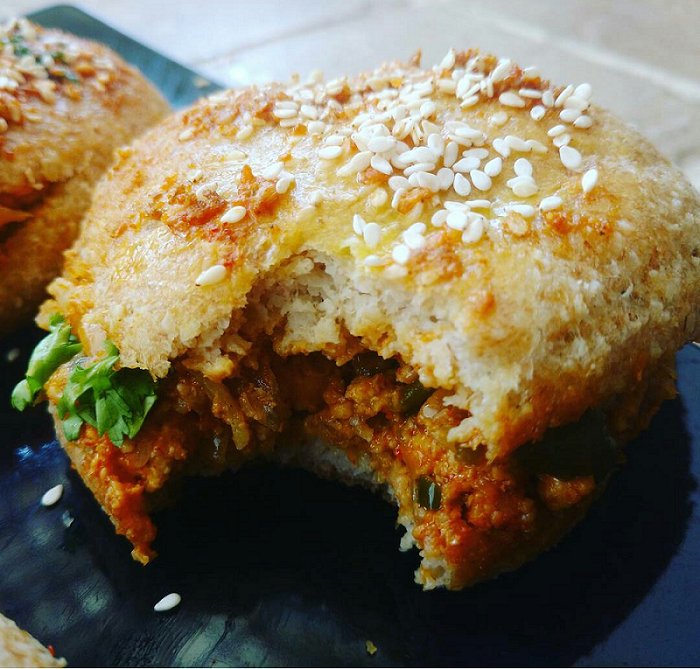 Why do you need to make these Tava burgers ? These are 2.2g net carbs per burger with 21g of fats . Say whaaaaat ?! 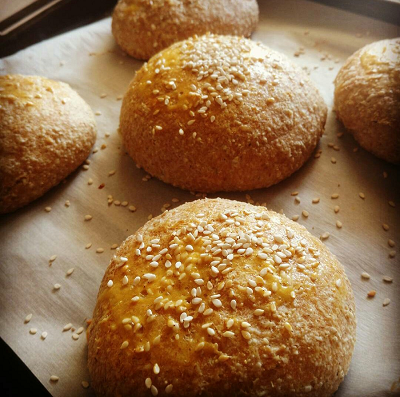 The buns include eggs but are not eggy . Yaaaassss ! So, enough jibber jabber ?! Let’s go ! 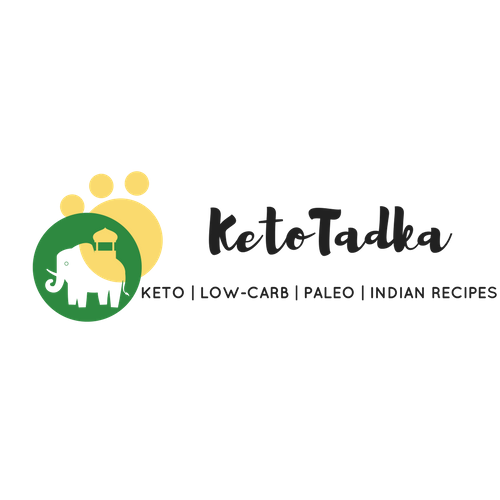 Ultimate keto burgers with Indian twist, super low in carbs and high in fats. Try these if you want a guilt-free treat ! In another bowl, whisk the egg whites. Add apple cider vinegar to it and mix. Add this mixture to the dry ingredients . Add boiling water and mix it till it forms dough. Observe the dough consistency. 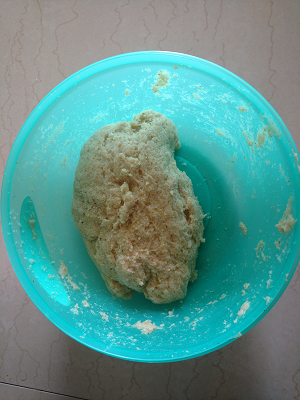 If you feel it is too runny, add more almond flour but measure it before. Make 6-7 medium sized balls and press them upon parchment paper keeping some distance between them. I made only 5 burgers because I wanted them big. But the macros for the recipe is counted for 7 burgers. So adjust accordingly. 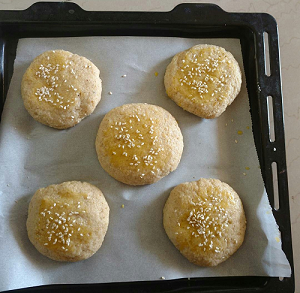 Sprinkle some sesame seeds on top. Bake at 175c/ 350F for 25 minutes. 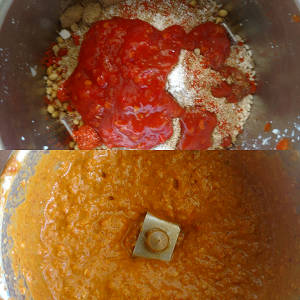 Take all the ingredients for the chilli paste (from the ingredients above) and grind until smooth. Keep 1 tsp of it aside and use rest for stuffing. Meanwhile, till the buns bake. Make the stuffing ready. Take butter in a pan and melt it. 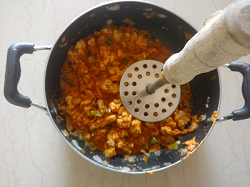 Add the onion, capsicum and cook for 3-4 minutes. You want the onions to be soft. Add the spice paste and mix well. Add the boiled cauliflower along with paneer and cheese cubes. 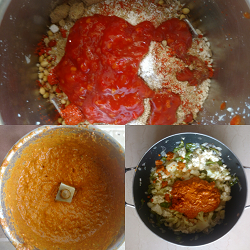 Let the spice paste mix with the contents well. Cover the pan with a lid for 5-6 minutes. Take a smasher/or a flat spoon and start smashing the stuffing to make it into an uniform mass. You can also grind it for 30 seconds but do not over-grind them into a paste. Take some butter and melt it in a tava/iron skillet. Add the spice paste you kept aside and some chopped coriander. Take the almond buns and slit them in half. Add the stuffing and fry them on the tava. Hold them in 2 spoons and just turn them to fry. Fry each side for 5 minutes. Serve with zucchin/eggplant/pumpkin fries. 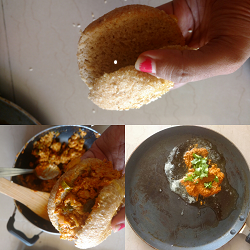 thanks a million for the recipe. Can you please post the recipe in US measurements? How much is a unit of egg? Do you mean 1 egg? Thank you! Can I make buns in a microwave :-/ ? you can make them using same recipe except the microwave should have convection mode and they will be ready in 15 minutes or less. use a microwave safe tray. Or you can find mug bread recipes online. Is it ok if I don’t put eggs…as I don’t eat eggs…if not…then is there any substitute for eggs? Yes you can use flax eggs in place of eggs. 1 egg = 1 tbso flax seed powder + 2.5 tbsp water. But the buns will not rise that much. Hi Sherry ! I have mentioned the units in grams, just convert them into oz. I did not do it in cups, as I wanted the measurements to be precise. What does 4 units Egg whites mean? Does it mean egg whites of 4 eggs?